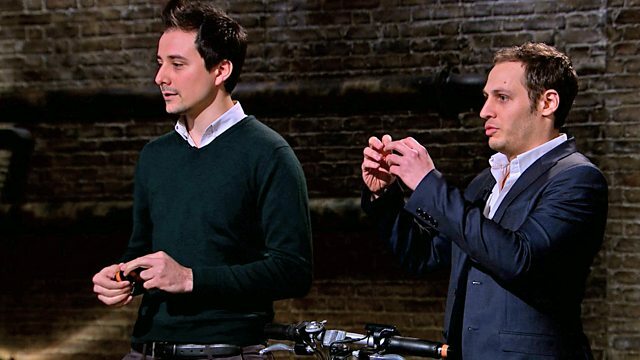 Budding entrepreneurs pitch business ideas to multimillionaires. An American entrepreneur is hoping for investment in her range of dolls with historical tales to tell. I've got to say, what Peter's just said is actually genius. and I'm not going to let you get away with that. Sorry, hang on, you've spent £400,000 on dolls? I'm glad it's your strategy, but I'm out. I'd love to find out what you're going to say. I think you've got a cracking business. I'm going to make you an offer. Let's go back to the evidence. Give me the evidence. will be the elevator pitch of a lifetime. They took inspiration from their product. from the Dragons. We're looking for them to smile. And we're the co-founders of Just Bee drinks. in return for 10% equity. we use a single drop of honey. very low in sugar, and less than 50 calories. But why honey? Well, my dad's a beekeeper. And my grandad was, too. why do you never see soft drinks with honey? This was the start of our big idea for a healthy drink using honey. from delis and coffee shops to hospitals and office canteens. We've recently started discussions with the national retailers. We feel this is the next exciting step for Just Bee. Thank you. Now, we have some drinks for you to try. to refresh the soft drinks market. and a 10% sweetener is on offer in return. I won't go through the sort of days you have in the Den. My first reaction is why hasn't this happened before? We were asking the same question. Why? You haven't found the answer? -could you quantify that now in terms of sales? and an operating loss of £38,000. What capital did you put into the business each at the start? So, in total so far, we've put £33,000 each in. from a high-net-worth individual already. And how much did he invest? So, he put in £150,000. -He got 23% for that. are currently sitting around 170K? -So, the current balance sheet is about 45,000 of stock. What does that make your net position, then? I can't tell you how many people can't do that. We've spent 20 minutes trying to get that out of some people. has clearly made a good impression. -What I want to talk about is sustainability. The fact that your father, your grandfather, were beekeepers. is intense farming of bees. is a little bit counterintuitive. -and then fill it full of sugar syrup. for the bees to survive winter. -OK. That was my question. -That was really important for us, yeah. that needs to go all the way back to the hive. -You know, we're looking after these as well. But you're not going to like what I'm going to say. But this is only me, personally. I don't actually like the taste. Honey has a very slightly antiseptic taste, doesn't it? It's probably just me. You liked it? You liked it? Can I just ask? -I do know what you mean about the taste. -That's why I don't put honey in tea. -Because it adds a flavour, sugar doesn't. -It's the first time I think we've heard that feedback. Although you've heard it from three people here. Now I mention it, yeah. who declares the taste of honey not to her liking. I just want to start with saying I love the product. -I think it's got a great flavour. But...I don't think it's a very mass-market flavour. And the squash market is not going to be substituted with that. but will still want to hydrate themselves with water. it doesn't mean that this is not possible. It just takes a lot of power, and a lot of marketing. What would I buy that for? That's quite a luxury, isn't it? That... That... I'm trying to see where it would go. where would they put it? we'd looking at the price point reducing to £1.49. Cos I can see it in the Pret, the Costas. I think that's quite... It is quite a big ask. doubts your drink's ability to reach a mass market, it's not good. But Peter Jones thinks he may have hit upon a solution. like the delicatessens, the specialists. with their small little squeezy concentrate. that goes mass-market and supermarkets. you squeeze it into your glass of water, kids have it at home. but I am going to say it. ..is actually genius. Because that's your squash market. as a squash, that's your mass-market product. Can I just ask about the stability of honey? Because of course there's a crystallising issue with honey. why you can't make cordial with honey. Ah, but no, it doesn't. Sorry. Are we still debating Peter's idea? -Because if we are, Peter needs to stand up there. -I just think it's such a genius idea. -Come out with something to replace squash. for 25% of the company. OK. Would you like to respond to that now? Well, look, I would prefer that you didn't try and negotiate. And then at the end of all of this we can...share the honey. whose ability to catapult a brand to the big-time is no secret. Will the cordial atmosphere continue with a bid from Deborah Meaden? First thing I will say, I think you've done a great job. I love the branding, I love the authenticity. but unfortunately, I don't like the taste. I've got to be able to sit here and say, "But it's lovely!" And I would be very clear about that. That's personal. I know people will like this taste. So, that's the only reason. But I won't be investing, I'm out. I love the story, and a big fan of bees. but there'll be a lot of people who won't. So, for that reason, I can't get over the line. Guys, I like what you've done. Great. I like you guys, too. you've got a perfect offer from the perfect Dragon. So, I'm not even going to play numbers with anybody on this. I'm not the right Dragon for you guys. So, for that reason, I'm out. joining Nick Jenkins and Deborah Meaden in going out. But Peter Jones doesn't yet have the deal in the bag. to mix things up a bit? I've said that. I love the flavour. it's going to be a real struggle in mass-market. and this is an area that they see is very saturated. And I do think it's going to be a hard sell. So, I'm sorry, I'm out. leaving just that one offer from Peter Jones. Now, it's all down to the negotiation. We hoped someone was going to make this competitive. ..a long way away from where we were at ten. We really do believe that this could be huge. ..it might not go anywhere. because you do, you've done really well. But I think that I add enough to justify why I would want 25%. Tangibly, what would you bring? And these are direct relationships. And 25% makes it interesting for me. -Shall we have a chat? -25% is a long way from ten. We'd be down, moving down to...28. Or just straight in with a counter offer. we'd like to tell you a few more things. at the moment, and Boots and Whole Foods. We believe there's a real value in this company. Based on what we've just said, we'll counter offer - 15%. Guys, I'm... The answer's no. I wouldn't go down to 15%. If we dropped down to 15, we're at a third each. But that would mean I'd have 25, you'd both have 28 each. And our other investor would have the rest. you'd still have complete control. You'd own over 50% of the company. One of them wants to do it, the other one doesn't. Anything clever we can do? We'd love to work with you, but we can't go above 15%. -Guys, look, you've made your decision. to change my offer, I'm going to have to say that I'm out. but resulting in a frustrating finale for the entrepreneurs. but not enough to drop his equity demand. -It's the right thing to do. Do you know what? I still genuinely wish them the best of luck. -I hope they make it. Although I hope they don't pinch my idea. It feels slightly crazy to have turned down Peter Jones. woken up tomorrow and could have regretted it. Next into the den is Francis Kane. to change the face of the doll business. The fact that the product clearly looks as good as it does. the other brands on the market at the moment. I'm hoping that that will come across. but we'll have to see when I get in there. but will the Dragons toy with investing in her range of products? of my four-year-old growing business. for my own daughter when she was much younger. plastic lipstick and pretend ironing boards. through 500 years of time. including Play Doll Of The Year two years in a row. 2015 for us saw sales of just under £90,000. in the first four months of 2016.
and I think their toys should be as well. And I would like to show you some product, if I may. is looking for a boardroom buddy. You have the start of the family tree, Matilda. she'd like a Dragon to invest £70,000 on it. Peter Jones has a confession to make. I'm quite an expert in dolls. -who's now nine, and my oldest daughter, who's 23. So, I have to say, there's something a bit eerie about the dolls. Not as friendly as I would have expected. Immediately struggling with the sort of...the look. and there's sort of like a darkness there. -Well, maybe slightly pensive. Maybe at times. And is that very much about you, Frances? Are you coming out in this doll? or being shoved too far, I felt, into the adult world. These dolls are supposed to represent nine, ten, 11-year-olds. And we're not always constantly smiling, I feel, are we? A product which makes Peter Jones feel uneasy. It's not a great start to Frances' pitch. this product stand out in a crowded market. -into a multi-million dollar business? What we've created is a whole brand behind the characters of the dolls. Is it a nice story, or do any bad things happen in that family? -So, who's killed who in the family? -and Tudor was not always happy times. And Matilda keeps a secret diary. Hence the title of her book, Matilda's Secret. playthings, with talk of their unique back stories. buying the product or the business? to believe that they can do anything and be anything. is to make it very real through history. but I think the dolls look like they've sacrificed a lot. They... They... They are girls who have suffered a lot. I wish you all the best, but I'm afraid I'm not going to invest. and decides to pass on the business opportunity. Can Peter Jones redeem things with talk of cold, hard cash? How much money have you spent so far developing the business? And it's rounding here, £400,000. -You've spent £400,000 on dolls? It's been a... It's been an investment a little bit every year. Where did you get that money from? part of it was from friends and family. But does Deborah Meaden share her conviction? To me, they're not joyous. -Did you ever play with dolls, Deborah? Spiders, snakes, all of those things. Never dolls. This is personal. You know, they don't make me feel good. They don't tell a great story to me. So, I'm really sorry, Frances, I'm out. Lydia, I bought you a doll. One of those over there. Are you excited about that? No, not really. Quite indifferent, really. Looks a bit sort of Botoxy. I'm sure you've done loads and loads of research. It's not a market I know anything about. something which is quite different. But I just can't get it at all. shows no interest in these bespoke dolls. And Touker Suleyman has also come to a decision. that has no appeal, in my view. I mean, in my own personal view. And I think you're probably a very professional person. You've built this whole business around the idea of this doll. You spent £400,000, but I don't see it going where you want to see it. I'll be happy one day if you get your money back. But it's not going to be with my money, I'm afraid. with a storyline behind what you're trying to achieve. But I personally think you've made some real fatal errors. -There's a few things that scare me about this doll. still looking at you, there's something really eerie about that. -that is make sure the eyes close when it lies flat. There're called, yes, sleep eyes. and I think you do have to go back to the drawing board. enough to keep the business alive and make the changes necessary. So, I'm going to say that I'm out. -OK. Thank you very much. Thank you. who couldn't convince the Dragons her dolls had mass appeal. She leaves the Den with no more cash than when she arrived. -I think she's really investable. I think the concept's right. It's sad it's looking like that. for all of the dolls? Probably not. So, maybe the Dragons might have missed out on this one. Touker, can you see me? I can see you. I can definitely see you. Are there hazardous conditions ahead? without having proven the model. but can I direct my questions to them? I thought they'd answered it. They haven't even paused for breath. navigate the Dragons to an investment? I think the product is exceptional. This has got Italian design written all over it. Gross margin £96,000 and you've broken even. Our next entrepreneur is hoping to make the world a prettier place. He's here to pitch a salon business, which he plans to take global. The Dragons really inspire me. And I can see a lot of synergy in terms what I do, what they've done. I hope I'm the latter. and I would hope that they'll see some talent in me today. and concept called Aenea, the science of beauty. for 10% equity in my business. Simply put, a wellness concept. with a high fashion and a celebrity focus. My root to market is franchising, for a number of reasons. and in parallel, 20 stores in the Middle East. So far, I've signed a franchise in London. and I have a letter of intent for Nigeria. that would like to target the retail market in the UK and Ireland. I've brought some products with me today. and I'm sure you have plenty of questions. -There's an exfoliator for you. Damien Zannetou thinks his business is a thing of beauty. Have I just broken mine? -Yes! Did you just break yours too? -How do you get this out? No, there's none in this. This isn't coming out, either. It's dying to come out, out of the top. Oh, it's not supposed to do that. The samples have hit some snagging issues with the Dragons. Cor, Damien, it's pretty badly made. When I'm pulling this out now, look, it's like, it goes everywhere. I wouldn't say it's badly made. It won an award in 2014, and we won that as a highly commended range. is robust enough for his liking. what on earth is this business? and them you pitch something completely different. it's a combination of a saloon, spa, clinic experience. we have all our own product line. So, why wouldn't somebody just set this up and do it themselves? Why do they need you? Um. difference is that we've combined the three models together. That's not difficult to do, is it? "and actually, we sell a range of cosmetics over here." which is the product line. It would take them years of research. They haven't got their own product line. If you'll just allow me to finish. Your own product line is really badly put together. but you're not allowing me to finish the answer. -No, because I've heard what I wanted to hear. -And I'm going to talk over you. -They don't have their own product line. They don't, because you're giving them a product line. brands everybody understands and knows and wants to buy? that everyone is aware of. because we won an award in 2014 for a very prestigious event. -business, haven't done it before. concept has been? Tell me about the numbers there? salon, spa, clinic concept could turn over about £750,000 a year. Has yours turned over £750,000? It has, yes. In year two, it did. Tell me about the numbers on that one. I want to know how successful that was. totally frank about the situation. Basically, I ran into a trademark dispute for my product line. So I had to force the company into liquidation. Why would you make the company bankrupt with a trademark dispute? -It was advice I was given. -By a lawyer, an insolvency practitioner. Who did you owe money to? At the time, I owed some money to HMRC. So, you've left that behind? -So the taxpayer didn't get their money back from you? -You started it in 2010. -You closed the company down. -And you started New Co.
New Co ended up with these products under a different brand name. and it's turned over just under £55,000 for the month of May. -That's running at about 20% profit. So you made £10,000 net profit? what would that have generated for you last month as a franchise? You are valuing a business that has so far made £1,000 at £1 million? If I'm able to answer. and I expected it to come from you as well. Yeah, I worked with a third party company. be on discounted cash flow. So they actually came back with a valuation of £5 million. Can I ask you, Damien, what is discounted cash flow? It's my cash flow at the end of year three, obviously. You know, it's three years of cash flow forecasted. Do you know what discounted cash flow is? -which in our case was 50%. I've handed that over to a third party. has provided Nick Jenkins with some cause for alarm. you've no understanding of what they're talking about. You don't understand discounted cash flow. You say "other people", it was always other people. "Other people told me to shut my business down. if I'm a potential franchisee? I've just got my redundancy payment of £30,000 or £40,000, right? I think, "OK, well, I'll go to this guy. "This guy will show me how to run my business so I can have success. just exactly how successful have you been so far? -Oh, well you didn't. It went bust. -how to run a business. -How am I supposed to have faith in that? in terms of running that business. -Have you ever done it? If you'll allow me to answer, I can give you an answer to your question. I'm very big on online marketing strategies and digital strategies. -OK, have you ever done it? So my website currently receives 11,500 unique visitors per month. I understand the digital marketing aspect. -you are a development franchisee. -You've only been going a month. So it's not proven, and they understand that. over his ability to roll out franchises. won't wash with Deborah Meaden. you've now turned into a franchise. -And it now turns over £600,000 a year. -So that's the evidence. Now, forget the words. -You can stand and talk to me till you're blue in the face. No, I'm not here to paint a pretty picture. -I'm only interested in fact. your franchise than actually doing it on my own. -because it's a new company and a start-up. -There is absolutely no evidence. How much money have you spent with your franchise consultants? you've spent your time building paperwork. I've done both. I have done both. All right, lovely. So let's go back to the evidence. when I go into your franchise. are development franchisees. They are aware that there is no evidence. So I'm just going to say those two words. I won't be investing. I'm out. That unproven business model loses Damien his first investor. restaurant business have a different perspective on things? so I know what's out there. they make it work, and they go, "You know what? "I've got a quick route to market here." Look at Domino's. Did a fantastic job. and that is why I'm out. you seem like a very nice guy. You need to learn a lot. Stick to what you're doing. -Don't try and sell anything to anybody at the moment. -Prove it for a whole year, then decide what you want to do with it. I'm afraid I'm not going to invest, I'm out. Damien, it's not gone well. in here without anything of substance. and rethink how you're going to do this. So I'm obviously going to say that I'm out. and becomes the fourth Dragon to walk away. It's left to e-commerce millionaire Nick Jenkins to have the final say. that you understand and you agree. I hope you understand that you haven't got anything yet. Can I show you some agreements that I do have? -Or is that not an option? so it's not good for them and it's not go to be good for you. Which is why I said I'll prove it. and run a decent business in Clapham. And then open another business and prove that you can do that. then think about a franchise business. That was kind of my strategy, but with your...help. Oh, good, well, I'm glad it's your strategy, but I'm out. Thank you for your time. I apologise if I've upset anyone. after a pitch that certainly provoked some intense debate. I'm going to make them hugely successful. We are a good team, he has business skills, I have technical skills. You're making me go dizzy, I don't know about you. Hello, Dragons. My name is Agostino Stilli. This is my business partner, Luca Amaduzzi. with a return of 5% equity in our company, CYCL. We are here today to present you WingLights. that flash amber on the side of your handlebar. noticed when it's most needed, when turning and changing lane. With a single tap, they emit a bright LED light. They are extremely easy to fit. and nowadays we already sold more than 8,000 units. samples around so you can get your hands on our product. ..and his business partner Luca Amaduzzi. Here we are. Two different colours. In return, they are offering 5% of their company. Peter Jones wants them to shed more light on the product in question. so what are the two different versions again? that is in your hands now. then you have a keyring with the two lights assembled on it. You can detach the two lights from the keyring like this. OK? And is this something you're doing full-time now? Yes, Agostino is also finishing a PhD in robotics part-time. So that's my last year. And give me an idea, you've sold them, what's the revenue? And what money have you got left over? with a gross profit of £96,000. On the net profit, at this stage, we broke even. the entrepreneurs are off to a good start. a potential fly in the ointment. Right at the beginning, you've got a lot about you, about your pitch. cos it's beautiful. You know, it feels nice, it looks good. there was quite a lot of time when I couldn't see that light. -Deborah is the person who will knock me off the bicycle. from the perspective of me riding a bike. -I thought they'd answered it, sorry. they haven't even paused for breath, they haven't answered it. but actually I, as a driver, I can't see you. There are other indicators in the market. Mostly they are placed just here. it turns on because you actually see it. I will show you what I mean. Can you see behind me? -This is kind of the smallest handlebar you can find. that's the problem, isn't it? It's not in front. If your right indicator was on now, I couldn't see it. -I can see the right, but I can't see the left. -If you are bigger like me, it doesn't work. -Touker, can you see me? -Can you see both lights? -Yes, I can see both lights. seeing them is only half of the problem. I'm struggling with it a little bit. I don't know that that's an indicator. That could just be a light. so from that, you should already have a hint. anywhere near Sarah in a car. any scooter or motorbike generally indicates turning. Bikes at night-time are covered in flashing lights. -And not this kind of flashing. According to UK law, anyhow, it is still mandatory to make a signal. and it's that signal that is going to stop me running them over. because you have to reduce your speed for turning. and you can announce the visibility of your signal system. another half of two flashing lights. so I'm afraid it's not an investment for me, so I'm afraid I'm out, guys. but which way is keen cyclist Nick Jenkins going to turn? and that's a pretty good indication that you are pretty backable. So I'm going to make you an offer. of the business, but I think you've got a cracking business. and he wants to join them. Now Peter Jones is next to have his say. is as good as I've ever seen a product. and making money out of this product. I'll say a very strange thing. I wish you had come in with a different product. I don't even cycle, so I can't convince myself. and rival Nick Jenkins' 15% off. who has a business connection to bicycles. We have a website called Bike Soup. you might want to invest? I have a lot of experience in the retail world. I know a lot of retailers in this sector. And I'm going to make you an offer. But I'm going to want more than what Nick wants. You want to go and have a chat at the back wall? -Yes, thank you for your offer. -Thank you for your offer. the entrepreneurs were looking for has got to be tempting. he's significantly devaluing the business. Will they go for the extra cash or Nick Jenkins' 15%? And, Nick, would you go down to 12 and a half? Yeah, I could do 12 and a half. and we are looking forward to working with him. to negotiate with the Dragons. but the guys from CYCL did manage to settle on a deal. You've done absolutely the wrong thing here. that my ten-year-old would probably decline? I can tell you one thing, you will look back and say, "Mistake." No, I'm not going to put myself in your shoes because I don't have to. I think you've blown it. Do you know, I think I'm going to make you an offer. If it helps, I'm already regretting going out. Peter Jones, Deborah Meaden, Touker Suleyman, Sarah Willingham and Nick Jenkins take their seats as a fresh batch of entrepreneurs prepare to give them the elevator pitch of a lifetime. In this episode, an American entrepreneur is hoping for investment in her range of dolls with historical tales to tell, a young Italian duo are hoping the Dragons will see the design flair and commercial possibilities in their bicycle indicator lights and a couple of bee keepers try to tempt the Dragons with their honey-infused drink. Will the Den be a hive of investment activity or will there be a sting in the tale?